Piper Home Security Review: Can A Cool Gadget Also Keep You Safe? Piper is the newest gizmo when it comes to home security. Oh wait. Let me correct myself. Piper isn’t just a home security system. Piper Security also provides home automation and video monitoring while you are away. This little device gives you a panoramic view of your home that you can see while you’re commuting to work, grabbing lunch, or having some drinks with friends, all thanks to its mobile app. So let’s dive in to take a deeper look at this fun, new contraption. What is piper Security and how does it work? 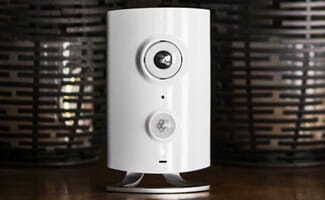 Piper is home security, video monitoring, and home automation all rolled into one high-tech gadget. It is a convenient solution for a smaller home or apartment, but can be adapted to larger homes, which we will discuss later. Piper is the name of the futuristic looking main system. It has a motion detector, microphone and siren to help detect and protect your home from an intruder. It has battery backup for an extra peace of mind. If Piper detects a loud noise or some type of motion while you are away, then it will immediately contact you with the video footage. Now you’re wondering, “What happens if I’m unable to be reached?” Fortunately, Piper lets you add trusted family and friends to your contact list in case you are unavailable. That way they will get the notification and can decide if it was a burglar or if your new pup knocked a plant off the table. The Piper camera can pan, tilt, and zoom so you can see a large area of your home. With its fisheye lens you can see from wall to wall and floor to ceiling, giving you a great view of your home while you are away. It also has a quad view, which gives you four views of different areas in the room. Finally, Piper will record certain events you program it to. For example, when there is a loud noise, if someone enters the room, or when a door or window opens. That way you can playback recorded footage and see what or who caused those events. If you have a large home, keep in mind that Piper can only see one room in your home. Monitoring from Piper does not mean that the system communicates with a Central Monitoring Station. So while the homeowner and anyone else with access to the app will be notified of an intrusion, it is up to that person to notify the authorities. It is important to distinguish between self-monitoring and central monitoring. Central monitoring comes with a monthly fee, and your system is professionally monitored by a station that is staffed 24/7. In the event of an alarm, the monitoring station has the power to dispatch law enforcement to your home. This is not possible with self-monitoring (what you get with Piper): you will need to call 911 on your own. While you may not have automatic law enforcement backup (it should be noted that the monitoring station typically still calls you to confirm the incident before dispatching authorities), you can save on monthly costs that typically range between $20-$50/month. Read more about why we recommend a monitored home security system and how it can save you 20% annually on your Homeowner’s Insurance. Piper Security can turn your lights and appliances on and off while you are away from home with its Z-Wave connect-ability. You can even have them turn on when a door or window or motion sensor is triggered so it deters intruders. With Piper’s smartphone app, you can keep tabs on your home’s environment while you’re away by checking on the temperature, humidity, lighting, sounds, and motion events. Piper’s app can support up to 5 different Pipers (equates to 5 rooms of Piper coverage in your home) so more of your home can be covered and visible to the devices. This works better for those with larger homes but can get costly. This was a new function added in February 2014. Piper will have more information in their updates section as new advances are added so keep your eyes open for it! Z-Wave accessories which can be added to your Piper to make your home even more secure. Z-Wave technology is a wireless communication protocol used specifically for appliances so you may control your home remotely. Z-Wave uses a low power radio frequency and is used in appliances, lighting, entertainment systems, etc. So basically, Z-Wave makes it possible to control a wide variety of devices that support the Z-Wave protocol (which is growing by the day). Some newer door locks and thermostats can even integrate with Z-Wave. What do consumers think of Piper Security? Because Piper is so new there isn’t a lot of consumer feedback about the product yet. If you’ve purchased Piper, let us know what you think in the comments below. Be the first to tell others about Piper!